I was first introduced to the East African Black Mud Turtle, or African Mud Turtle, (Pelusios subniger) when working for a NYC animal importer many years ago, and they have remained great favorites of mine to this day. In common with many species that have evolved in harsh environments, African Mud Turtles are among the hardiest of reptile pets; longevities in excess of 30 years have been recorded. 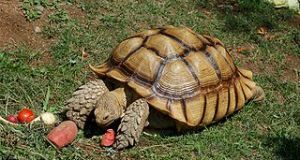 Perhaps due to their somewhat drab coloration, these interesting, responsive turtles are often overlooked, but that is a mistake – all the private and professional keepers to whom I’ve recommended them have been most pleased. The dark brown to black carapace is broad and oval-shaped, and averages 6-8 inches in length; some individuals may approach 10 inches. 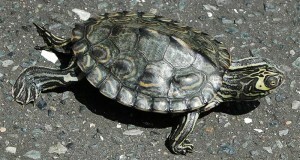 The neck is retracted into the shell by being “folded” to the side, as is seen in the South American side-necked turtles. The African Mud Turtle is placed in the family Pelomedusidae, along with 26 relatives; 2 subspecies have been described. It is sometimes confused with the superficially similar (and equally hardy) West African Mud Turtle (Pelosius castaneus) and the African Helmeted Turtle (Pelomedusa subrufa); please see photos. All may be kept as described here. The African Mud Turtle’s huge range extends across much of eastern Africa, from Burundi and Tanzania, south and west to Congo, Zambia and Botswana. It also occurs on Madagascar, the Seychelles, and several nearby islands, and has been introduced to Mauritius and, of all places, the Caribbean island of Guadalupe (I’m guessing there are some roaming about south Florida as well!). The Seychelles population is considered to be a distinct subspecies. Largely aquatic, the African Mud Turtle lives in well-vegetated rivers, marshes and swamps, as well as in seasonally flooded pans (low areas that hold water for a time) within savannas. Individuals occupying temporary water bodies burrow into the mud and aestivate (become dormant) or travel across land when their habitats dry out. Like the Helmeted Turtle, the African Mud Turtle is often seen in water holes frequented by zebra, elephants and other large mammals. African Mud Turtles quickly learn to “beg” for food as soon as their owner appears, and make excellent, responsive pets. They become quite bold once acclimated to captivity, and do well in busy locations. If provided proper accommodations, captive breeding is possible (please post below for details). Quite powerful, they are capable of administering severe bites and scratches when frightened, and must be handled carefully. African Mud Turtles spend most of their lives in water, but are more “bottom crawlers” than swimmers. Their habitat needs parallel those of the American mud and musk turtles. The aquarium’s water should be of a depth that allows the turtle to breath while it is standing on the bottom of the tank (i.e. without having to swim to the surface). If provided with easy access to land, adults can also be kept in deeper water. The water area should be stocked with driftwood and other structures that can be used as sub-surface resting sites. Hatchlings should be kept in low water…just enough so that they can breathe without swimming. Floating live or plastic plants will provide youngsters with security…they are on the menus of many African predators, and remain shy for a time! A single small adult might get by in a 40 gallon aquarium, but a 55 gallon or larger tank is preferable. Zoo Med’s Turtle Tub, wading pools, and koi ponds can be fashioned into excellent African Mud Turtle habitats. Outdoor housing is ideal, assuming that raccoons and other predators can be excluded. A dry basking surface is necessary. Commercial turtle docks and ramps work for smaller specimens, but large adults may sink anything that is not affixed to the glass with silicone adhesive. Cork bark wedged between the aquarium’s sides is another option. Turtles are messy feeders and very hard on water quality. Unless the enclosure can be emptied and cleaned several times weekly, a powerful submersible turtle filter or canister filter will be necessary. Even with filtration, partial water changes are essential. Removing your turtles to an easily-cleaned container for feeding will lessen the filter’s workload and help to keep the water clean. Please see the articles under “Further Reading” for more on water quality and filtration. 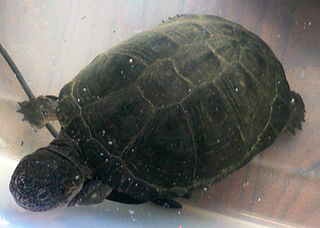 African Mud Turtles are best kept in bare-bottomed aquariums; gravel traps waste material, greatly complicating cleaning, and may also be swallowed. A source of UVB radiation is essential. Natural sunlight is best, but it must be direct, as glass and plastic filter-out UVB rays. If a standard florescent bulb is used (the Zoo Med 10.0 UVB Bulb is ideal), be sure that the turtle can bask within 6-12 inches of it. High-output florescent UVB bulbs and mercury vapor bulbs broadcast UVB over greater distances. Water temperatures of 78-82 F should be maintained. Large individuals may break typical aquarium heaters, so choose a model designed for use with turtles. An incandescent bulb should be employed to heat the basking site to 90-95 F.
Wild African Mud Turtles take a huge variety of foods, including fish, tadpoles, snails, carrion, insects, frogs and small snakes. Aquatic and terrestrial plants have been reported in the diets of some populations as well. Pets should be offered a diet comprised largely of whole animals such as fish, earthworms, snails, pre-killed pink mice, crayfish and prawn. Whole freshwater fishes such as minnows and shiners are the best source of calcium for turtles, and provide other important nutrients not present in prepared foods. Offer fish at least once weekly. A steady goldfish diet has been implicated in liver problems in other species, so use these sparingly if at all. Cuttlebones or turtle calcium blocks will also be accepted by many individuals. 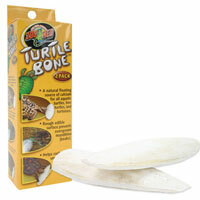 Other important food items include various turtle treat foods and freeze-dried krill or shrimp. Crickets, butterworms, calci-worms, roaches and other invertebrates will also be consumed with gusto. A high quality commercial turtle chow (the various Zoo Med pellets are my favorites) can comprise up to 50% of the diet. Reptomin Food Sticks and trout chow also provide excellent nutrition, and may be offered regularly. Gravid (egg-bearing) females usually become restless and may refuse food. They should be removed to a large container (i.e. 5x the length and width of the turtle) provisioned with 6-8 inches of slightly moist soil and sand. Females that do not nest should be seen by a veterinarian as egg retention always leads to a fatal infection (egg peritonitis); oxytocin injections usually resolve the problem quickly. The 6 -18 eggs may be incubated in moist vermiculite at 82-85 F for 55-80 days.